In theory, we can consider software testing as a very rationale approach. You start from unit of code or requirements and then you create the tests that will prove that your software does what it is expected to do… and doesn’t create problems with edge cases. 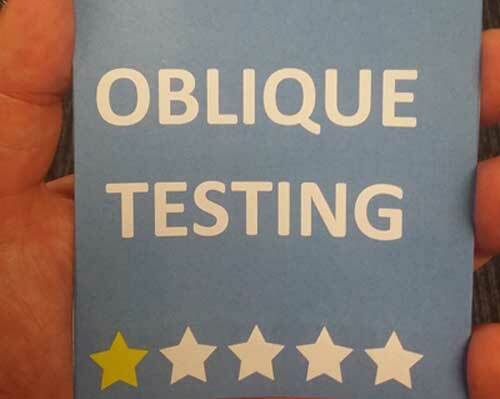 In his book Oblique Testing, Mike Talks propose to add an additional perspective to software testing using the oblique strategies approach. The oblique strategies is a set of card originally used by music producer Brian Eno to make recording artists try something new. This book adapts this approach to the software testing world by providing a set of cards. Based on fictional bad reviews for apps., they are mainly focused on the testing of a mobile app, but they are generic enough to be applied to other contexts where you have many customers using your software. The book provides also some suggestions on how to apply this approach in Agile and traditional software development projects. Oblique Testing is an original approach to perform some exploratory testing where the full project team is involved and not only the software testers. I will suggest to read this very short book to every software tester or project manager that wants to introduce a different perspective in its software testing activities. As I mentioned before, when we are testing, we’re using our imagination to work out “ways the software could go wrong”. The most annoying bugs are the ones which get the team clutching their heads going “but that shouldn’t happen”. You develop an overconfidence in your architecture, a tool, or your previous testing. It’s important to note, the card you’ve drawn does not apply to the stories this sprint, but to look in a bigger way at your system “in the large”. The obvious concern for any team will be “is this non-story task going to undermine the work on our story?”. It will – but not by much, just a fraction. But the benefits are you should be finding issues that aren’t really on your radar at all.